Your friend is probably feeling down now that his or her twenties are over. College is done and gone are the youthful days of freedom and fun. With the 30th birthday comes a lot of responsibilities. 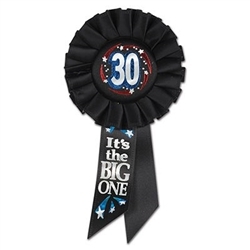 Show your friend your warm birthday wishes and remind him or her of all the fun that being 30 can bring with the 30 It's The Big One Rosette Ribbon! This black ribbon is a great reminder that this big day is an exciting milestone! In your 30s you can look forward to your kids growing up, spending time with your spouse, getting promotions at work, and more! The 30 It's The Big One Rosette Ribbon has bright metallic graphics in gold, red, silver, and blue, that are sure to catch anyone's eye. This award ribbon truly is a great present. This sincere gesture will be appreciated by any recipient. Check out some of our great supplies for throwing a 30th birthday party, like the 30th Firework Stringer, "30" Whirls, and Multi-Color 30 Fanci-Fetti!